Did you know there are over 500,000 children living on the streets of Zambia? That’s right: half a million children with no one to look after them. Also, over 30% of all children in Zambia are orphans. You probably imagined that those numbers overlap, and you are right. But, as we have learned over the many TIE campaigns, there’s more than misery in the streets. There are dreams, and voices, and stories, and so much potential. The Barefeet Theatre sees that. 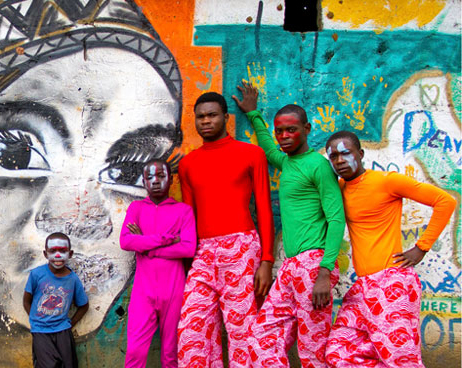 They are an outward looking cultural movement founded in Zambia in 2006 by a group of Zambian and Irish artists, that works to enhance the lives of at-risk children and youth in Zambia. Barefeet provides them creative opportunities to express themselves and achieve their full potential. It started as simple theatre workshops for street children, that aimed to educate them about important topics, such as HIV/AIDS, violence, health, drugs and alcohol and children rights and to redirect them to Children Centers and get them out of the streets. Now it has grown organically into a vibrant, exciting and ground breaking organization. Barefeet uses the power of art, performance and entertainment to inspire, build and transform lives. To provide the children with a voice and help them discover and achieve their full potential. Now Barefeet have their own Performance Company, made up by all those street children that came to see a simple workshop. And you wouldn’t believe how incredibly talented they are. Last year, Barefeet welcomed their first TIE placement. Holly McGavock spent a month with them, learning about the organization and their Performance Company, and she developed an overall communications strategy for them. By getting to the core of who Barefeet are and how they want to communicate their personality, they now have a very strong sense of identity that can be infused into all of their programme areas. Now they want to make things happen on the ground. This second TIE placement will help them publicize their Performance Company, and make their work widely known in Zambia. They want more people and companies to see what they stand for and get excited about the potential in it. By building a broader audience, Barefeet will become more self-sustainable and will be able to reach even more children in the streets of Zambia.